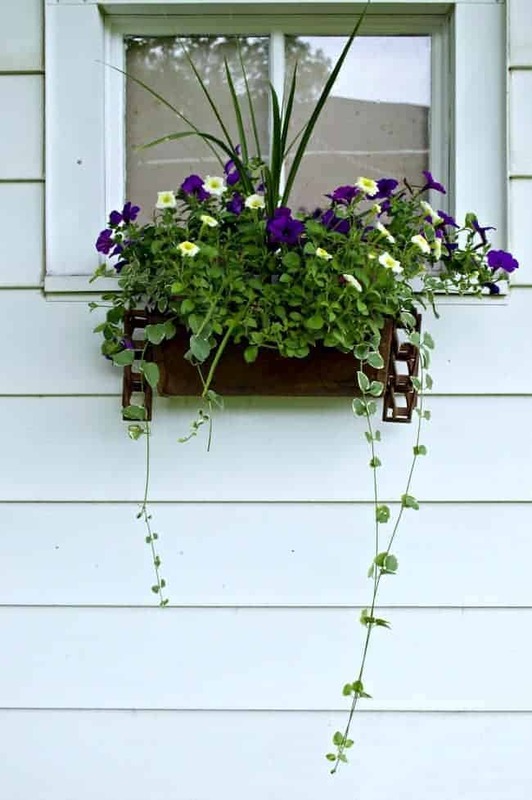 A rustic flower window box with vintage charm. 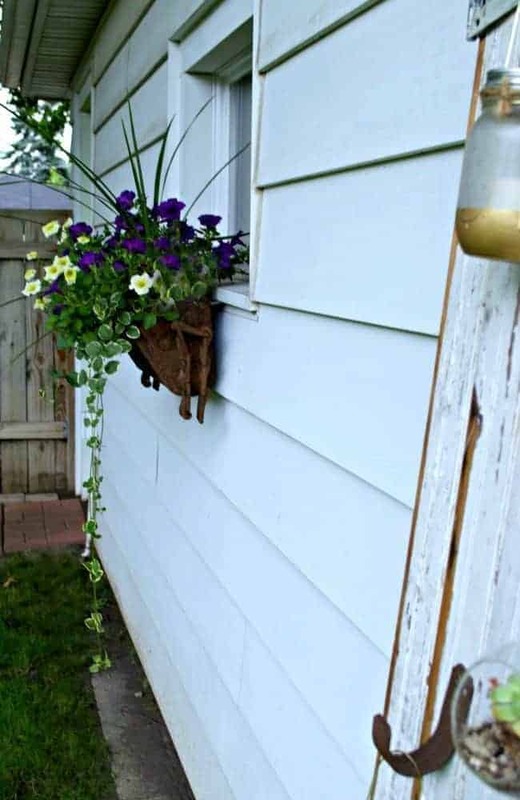 I showed you my new, rustic window box that I found at the flea market, and I promised to share what it was and how it looked planted with pretty blooms. It’s taken awhile for the weather to warm up but the flowers have finally grown enough that I can show you. When I posted this earlier, asking what you thought it was, there were a lot of good guesses. One of you smarties knew exactly what it was. It’s part of an old corn crib conveyor system that carried grain in the cups and was chain driven. 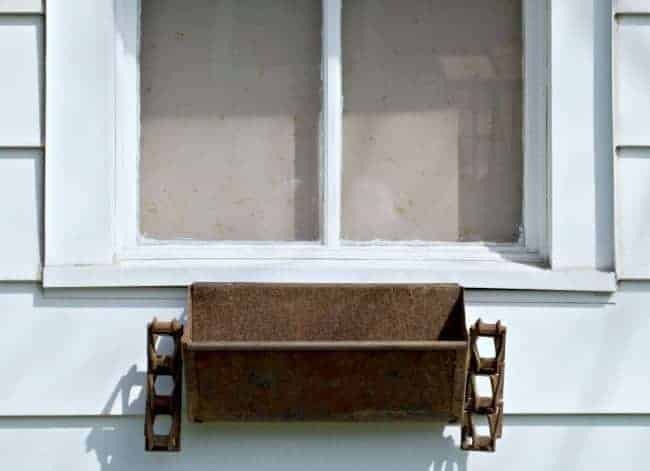 I found it at the flea market and knew it would be perfect for a window box for the garage window. I didn’t want to lose its rustic-ness so I kept it pretty much as is. It did get a good cleaning and a couple of holes in the bottom for drainage, but that’s it. To hang it up, I put two screws under the window sill and hung the curved edge right on the screws. After I hung it up the front was hanging low and, when I watered the plants, the water would run out and onto the ground. To fix it I put two small pieces of scrap wood behind it to keep it level. The wood keeps the front up so the flowers could get a proper drink. It may not be everyone’s cup of tea but I love that it’s rustic and different. Talking about repurposing…I took an old, metal tomato cage and turned it into a plant stand. Check it out here. Have you reused or repurposed anything lately? I’d love to hear about it. What a beautiful garden box, Great idea! Rusty Gold! 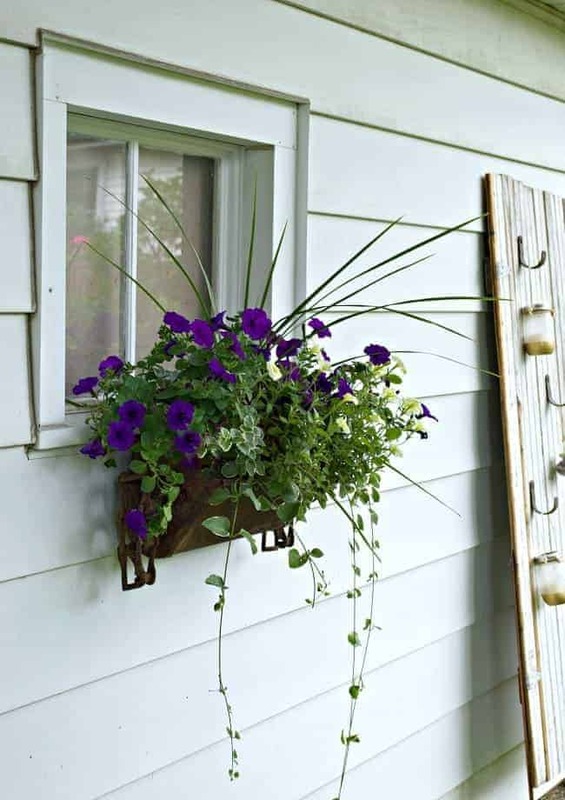 Fabulous and creative window box. Oh my goodness that takes me back to the farm and if I knew then what I learned today a few of those pieces would have gone missing! You are so lucky to have had such a mind summer. Rainy and hot here in FL. Thanks Becky! Who knew that, when we were kids, we’d see farm equipment as treasures, right? I remember the hot summers in Florida! We just started to have summer weather here, and it’s already the end of July. This is real rustic perfection! Thanks for the sweet comment Heather! 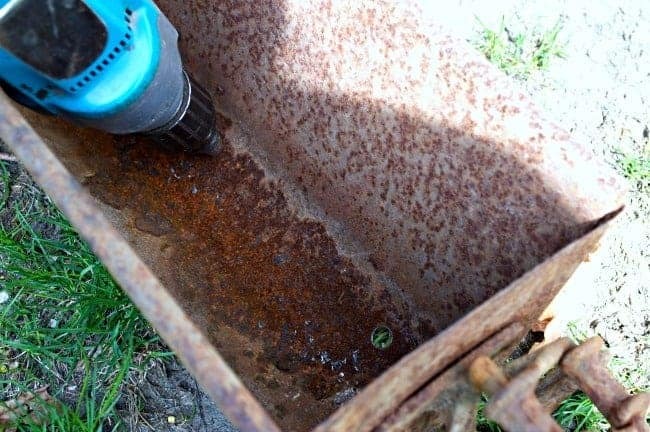 I totally agree, there’s nothing like knowing you turned something old and rusted into something a useful treasure. 🙂 It’s the best kind of DIY. Oh My, I love it! It’s so different, and now it’s all full of beautiful plants it looks amazing. Thanks Julie. Yes, it’s certainly not something that you see often but it makes the perfect window box. 🙂 I appreciate you stopping in. This is just BEAUTIFUL! I loved seeing how it went together, and the selection of flowers would have been those that I would have selected because I love that combination. Very nice, thanks for sharing. 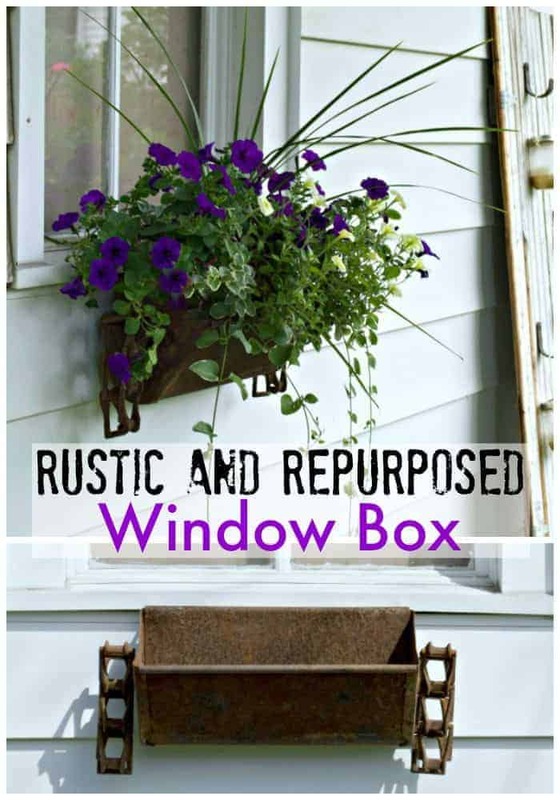 That’s such a fun (gorgeous) way to repurpose a rusty piece. 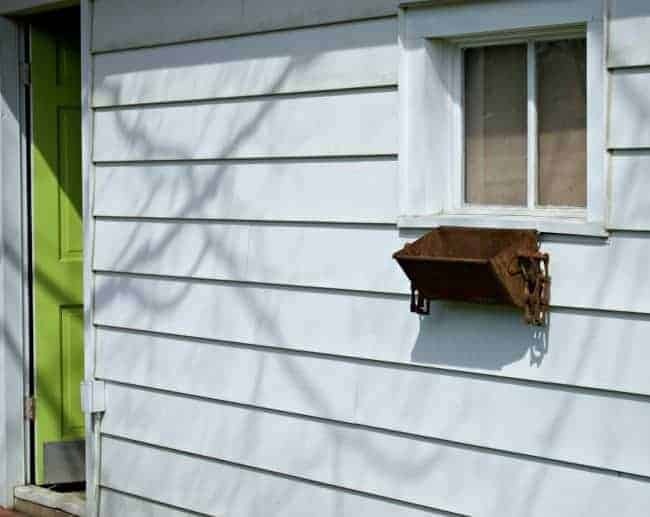 The textures of the flowers/the rusty box/siding behind it – so pretty! I would love for you to share this at my linky party (went live late last night). This is so fun! Thanks so much Heather. I’m loving my old window box. 🙂 Thanks for the invite to your linky, I’ll be sure to check it out. 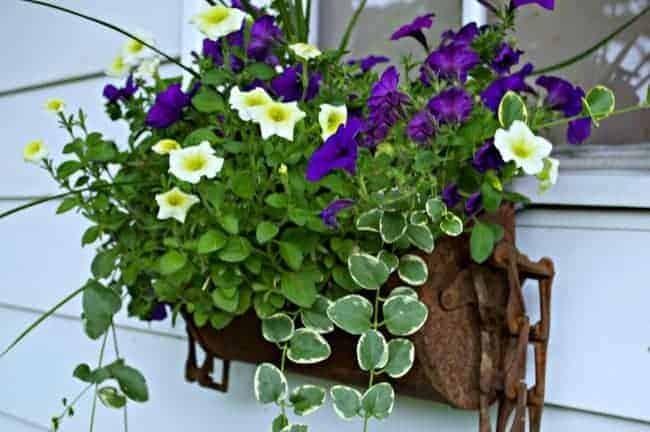 Your flower box is simply beautiful!! I love it Kristi! It looks great with the flowers and trailing vines. Well, you already know about my enamel pot with red handles and trim that I used as a flower pot centerpiece on my 4th picnic table. We will be going to my side of the family’s picnic and believe me I have a large family! Although I am an only child I have tons of cousins and with one family I have 11 cousins and then there are all their children and all their children. A nice big Italian family! This is the first time they will meet Piper, my younger son’s daughter. Then on Monday we will be celebrating our 43rd wedding anniversary and my older son is 39 today! My, my, my, how time flies! Enjoy! Thanks so much MJ! I loved your enamel pot with the red handles, so cute. I hope you had a great time at your family picnic and a very happy anniversary to you and your husband! Wow, 43 years is an awesome achievement. I don’t know many people married that long anymore. Congrats! Thanks so much for the kind words Debbie. I hope you have a great weekend. Love it….it has great charm and you filled it so beautifully! Many thanks Shirley. Hope you have a great weekend! So unique & perfectly adorable! Very pretty! You definitely have an eye for design and some real vision. Fabulous! Thanks so much for the kind words my friend!